If the teeth are the stage, the lips are the curtains. Paying attention to how both the stage and the curtains look completes the overall aesthetic look. Dr. Dahlkemper has been helping patients achieve the smiles they have always dreamed of for a number of years. We have extended our services to other areas of the face as well, allowing your youthful appearance to go beyond your smile, and help restore the confidence and appeal that aging may take from you. Dentists, with their extensive head and neck training, have the ability to administer injections in a safe and comfortable manner. Dentists are artistic and without question perfectionists. As with any specialty procedure that a general dentist opts to provide, they should have the appropriate training and work within their comfort and ability zone. Dr. Dahlkemper has completed additional training for the specialized use of Botox and Dermal Fillers. She is a member of the American Academy of Facial Esthetics. As a dentist, Dr. Dahlkemper is very well-trained in the musculature and anatomy of the face and with that comprehensive experience no other doctor can give an injection better than a qualified and experienced dentist. 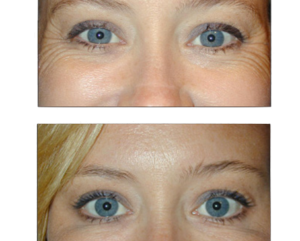 BOTOX Cosmetic is administered via a few tiny injections directly into the muscles responsible for age lines. By blocking the release of a chemical that causes these muscles to contract, BOTOX Cosmetic enables them to relax. The effects are very localized, and when administered by an experienced Doctor, do not affect your ability to smile, laugh, or otherwise show expression. TMD or Temporomandibular Joint Disorder is disfunction or inflammation of the temporomandibular joint and/or the surrounding muscles. TMD can be acute or chronic in nature. (TMJ or temporomandibular joint connects the skull to the lower jaw). The disorder results in significant pain and impairment for many patients. Frequent symptoms of Bruxism and TMD are headaches, earaches, facial pain, chipped teeth and chewed inner surface of the cheek on the inside of the mouth. Chronic grinding or clenching will often cause hypertrophy (enlargement) of masseter muscle – the main muscle that is used for chewing. This muscle is located at the angle of the jaw. Grinding or clenching builds this muscle and makes it stronger, like lifting weights build muscles for body builders. The stronger the chewing muscle gets the more damage grinding or clenching causes to the teeth and TMJ. Headaches, earaches and facial pain also tend to get worse with time. Dr. Dahlkemper uses Botox to treat chronic teeth grinding. Besides relief from jaw pain, tension and headaches, some of her patients see a change in the way that their face looks. The square, heavy appearance of their lower face softens into a more normal and esthetically pleasing one. This change occurs over two or three sessions of Botox, as the masseter muscle gets smaller. Patients have also reported a marked reduction in their general stress level as their grinding disappears or gets reduced. Botox treatment for teeth grinding is painless and quick (5 minutes). Results from Botox treatment of bruxism start two to three days after injection and can last for 3-6 months. During your no cost initial consultation, Dr. Dahlkemper will evaluate your unique needs, desired end results, and explain your options. She will also help you determine which treatment, or combination of treatments, will work best for you.